The start of 2019 marks not only the 10th anniversary of S&P Dow Jones Indices in Dubai, but also the expansion of our single- and multi-factor index series into the Gulf Cooperation Council (GCC) region. 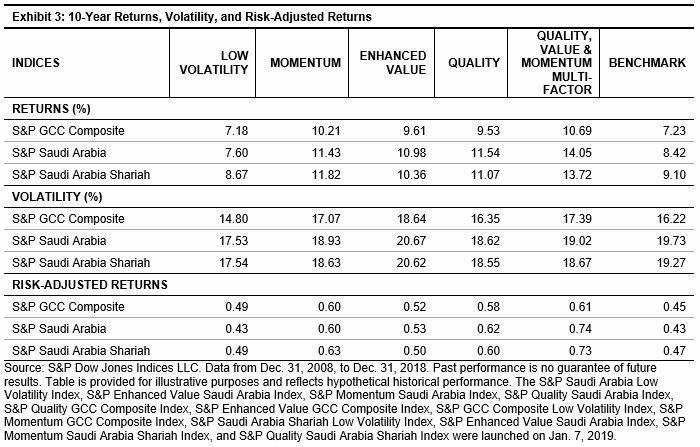 Our current suite of single factor indices, including those covering low volatility, momentum, enhanced value, and quality factors, are now available based on the S&P GCC Composite,[i] S&P Saudi Arabia,[ii] and the S&P Saudi Arabia Domestic Shariah. [iii] A multi-factor index that combines quality, value, and momentum is also available for the same three markets. The introduction of these indices into the GCC region is apropos, as these key markets now have the necessary liquidity and market capacity to support these new strategies. 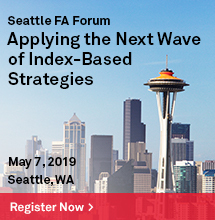 Moreover, the presence of factor indices in the region will provide investors with greater exposure to risk factors and enable them to use the indices to target specific investment objectives. The construction of the factor indices in the GCC region is similar to that of our current factor indices, subject to additional selection, capping, and liquidity criteria. For example, target stock count for the S&P Saudi Arabia Factor Indices and S&P Saudi Arabia Shariah Factor Indices is determined by a maximum of 30 stocks, 20% of the number of constituents in the universe, or the number of stocks (ranked by factor score), such that the sum of their free-float market capitalization is at least 50% of the free-float market capitalization of the eligible universe. 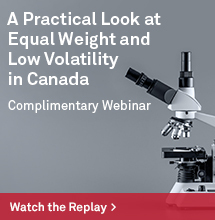 The indices are subject to capping based on security weight, country weight, and GICS® sector weights. Additionally, stocks must have a minimum six-month median daily value traded of USD 1 million (or USD 500,000 for current constituents) as of the rebalancing reference date. 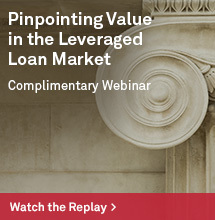 These additional criteria ensure that there is sufficient liquidity to support the strategies. Our current suite of factor indices spans across various markets including, but not limited to, the global, developed, and emerging markets. 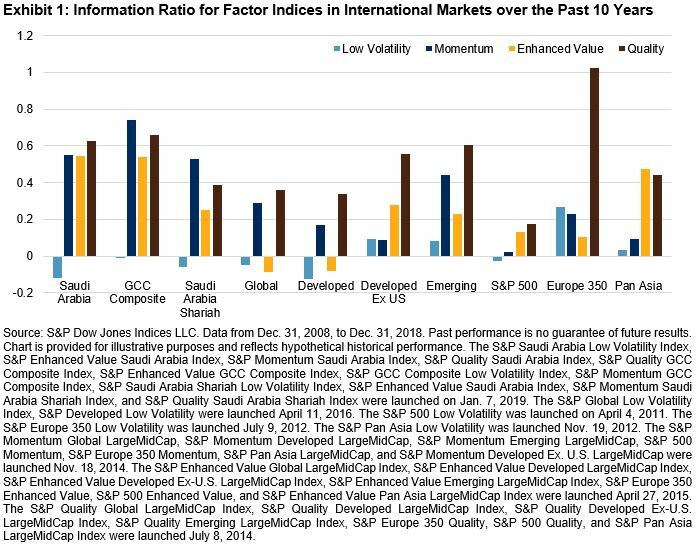 When compared to the factor indices in these regions using the information ratio, we observed that the performance of the S&P GCC Factor Indices was historically similar to what has been observed in other regions. In fact, over the 10-year period studied, we saw that the S&P GCC Factor Indices achieved higher excess returns per unit of tracking error for most factors relative to the other regions. Overall, the factor indices in these markets outperformed their benchmark. 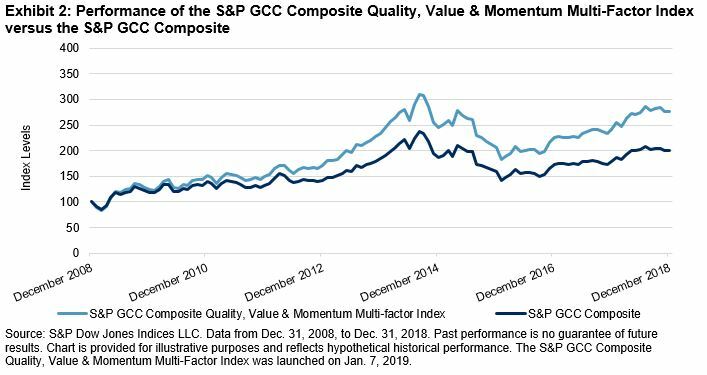 In Exhibit 2, we highlight a specific strategy—the S&P GCC Composite Quality, Value & Momentum Multi-Factor Index. We see that this strategy consistently outperformed the benchmark, demonstrating that it was effective in providing stable excess returns and improved risk-adjusted returns. An interesting point to note when looking at the performance across all of the factors for the GCC region is the decrease in performance around 2015-2016. This is a result of the price of oil dropping during those years to historical lows due to oversupply and disagreements between Organization of the Petroleum Exporting Countries (OPEC) and non-OPEC nations. As a result, we see that the five-year performance of the indices was lower, as the index values were recovering to reach their peak values from 2014. Exhibit 3 shows that the factor indices, with the exception of low volatility, outperformed their benchmark over the 10-year period. The indices mostly had higher returns and higher volatility, thus, they all outperformed their respective benchmarks on a risk-adjusted basis. We also observed that the quality, value & momentum indices outperformed the single factors in each region. 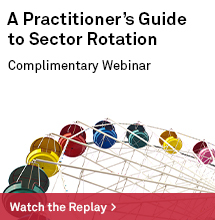 This shows us the potential benefits of combining single factors, including diversification and improved performance. Stay tuned as we continue to build out new strategies to fulfill market demand in the GCC region.